One who travels the world can truly appreciate enormous variability in care for patients with chronic venous disease among countries, regions, specialties, and providers. In these myriads of settings, one treatment modality is accepted and used universally. 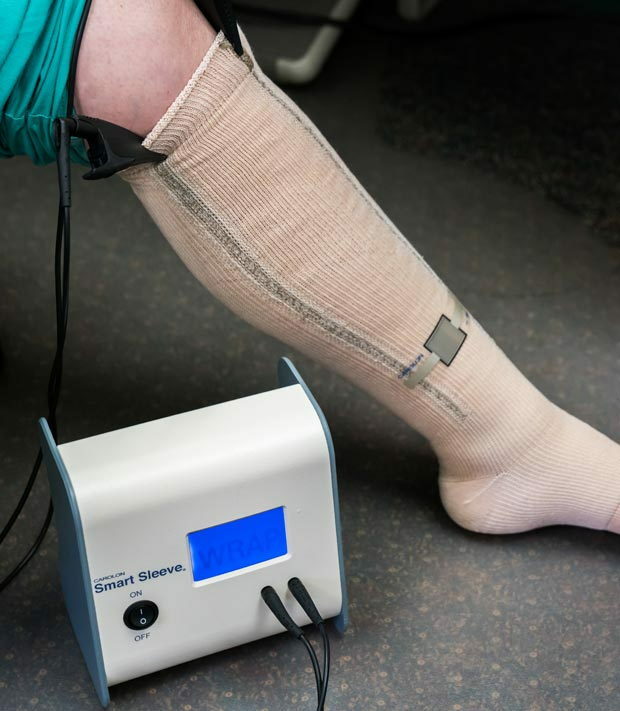 Any wound or vein clinic, or physician office that has patients with venous edema or ulcers, has some kind of compression device such as bandages, stockings, or pumps. Apart from centuries-long tradition, this practice is supported by strong scientific evidence.1 Paradoxically, the question of how much pressure is needed—in other words, what dose of compression should be used?—has not been addressed until recently. Although this question looks simple on the surface, it is, in fact, complex and multifactorial. The pressure delivered by a compression device changes considerably—not only when patients change their body position or engage in different physical activities, but also when the leg volume changes during the day or due to other factors like increased salt consumption or changes in cardiac function. Fortunately, the two main determinants of the dose of compression are controllable. The compression material or device can be selected based on the disease and patient-related circumstances. The interface pressure at the time of initial application of a compression device can also be controlled. The labeling of stockings and markings of some Velcro devices ensure that a certain level of pressure is delivered. Most bandages, however, do not have an easy way of knowing what pressure is applied, and instead rely on the skills of the person who applies the bandages to deliver a desirable pressure. Although no conclusive evidence is available regarding an optimal pressure for treatment of venous ulcers, consensus exists that 30-40 mmHg pressure should be used for the majority of patients. In real-world clinical settings, multi-component bandage systems are typically used in venous ulcer patients, so the dose of compression is unknown. Experienced wound care providers apply bandage systems daily with negligible incidence of complications and good clinical outcomes. It is reasonable to assume that they deliver consistent doses of compression targeted to a level desirable for a particular patient. However, testing this hypothesis has shown the opposite. Training can help achieve more consistent application of bandages with reaching the target goal and maintaining a compression profile of maximal interface pressure at the ankle level and gradually reduced pressure towards the knee-level. Current practice of applying compression devices with unknown and uncontrolled interface pressure have several important ramifications. Variation of the dose over time may lead to suboptimal treatment and less than desirable outcomes for patients with edema and venous ulcers. In some patients, variable compression may negatively impact lymphatic function.12 Patients with mixed ulcers and comorbid diabetes or peripheral arterial disease are particularly challenging. Applying excessive compression in these cases can lead to serious complications, such as pressure wounds and critical limb ischemia. Finally, when this routine practice of ignoring the dose of compression is used in research studies, it compromises integrity of the data, may lead to erroneous findings, and makes findings of these studies reasonably questionable. Translation of such research into clinical practice and health care policies introduces a risk of negative impact on the health and well-being of large patient populations. The sensors of Kikuhime device, SIGaT tester, and Picopress have to be placed at the measurement point before or during bandaging, which requires additional effort and sometimes an additional person (fig. 1). Pulling those sensors back after the bandage is applied is not easy and can damage the sensor. Figure 1. Use of tape or a second person is necessary in order to keep the Picopress sensor in the desirable position during bandaging. Carolon Smart Sleeve uses a piezoelectric sensors mount on a low-pressure liner with a built-in conductors (fig. 2). This liner stays under the bandage, allowing repeat pressure measurements. However, it is a single-use device and needs to be replaced with every bandage change. 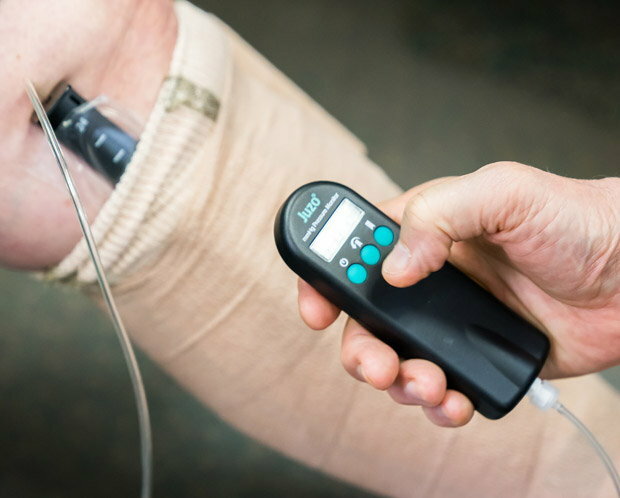 The Juzo pressure monitor has a slider that makes it easy to remove the sensor after the bandage is applied, or insert the sensor under an already-applied bandage. 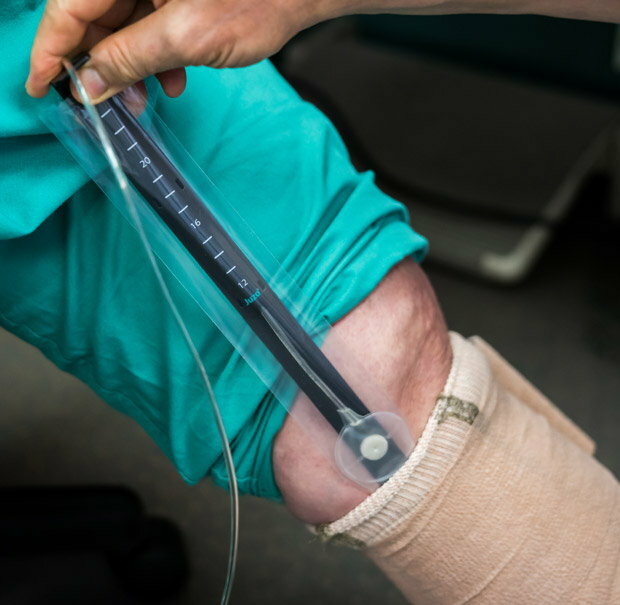 With single-use protecting sleeves, the Juzo pressure monitor can be used with multiple patients, which makes a single-device sufficient for a busy wound clinic. Figure 2a. A Juzo pressure monitor can be inserted under the bandage to a desirable point. Understanding the need for controlling interface pressure, inventors and entrepreneurs are working on a new generation of interface pressure monitors. 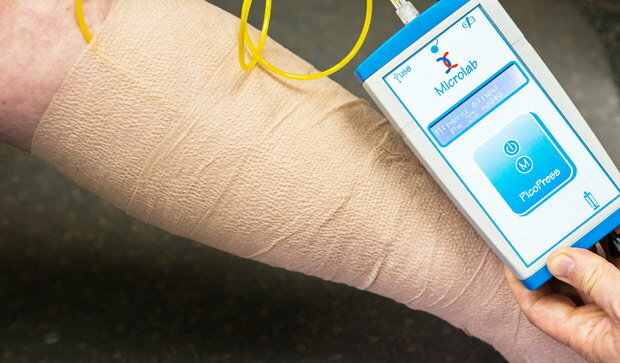 Smaller, lighter, and wireless pressure monitors connected to a smartphone have great potential for ensuring that patients continue to receive a desirable pressure dose and the bandages are promptly adjusted when this pressure becomes too low or too high. For the wound care clinics, however, a simple inexpensive pressure monitor that can be used for training, quality assurance, and for application of an appropriate compression dose for the majority of patients is sufficient. Figure 2b. The pressure measurement can be done either during bandaging, or after the bandage has been applied. Figure 2c. Carolon Smart Sleeve allows pressure measurement during bandaging, and at any time after, but the sensor position is different from B1 point. Regardless of the specialty, most of the physician offices have a blood pressure monitor, and measuring the blood pressure became a routine part of every clinical visit. The time has come for every office and clinic that uses compression therapy to have an interface pressure monitor and to make the interface pressure measurement a routine part of clinical visit for every patient who wears a compression device. Interface pressure monitors are now readily available, and the practice of blind application of compression with unknown dose should be no longer acceptable. O'Donnell Jr. TF, Passman MA. 2014. Clinical practice guidelines of the Society for Vascular Surgery (SVS) and the American Venous Forum (AVF)—management of venous leg ulcers. J Vasc Surg 60(2 Suppl): p. 1S-2S. Partsch H, Damstra RJ, Mosti G. 2011. Dose finding for an optimal compression pressure to reduce chronic edema of the extremities. Int Angiol 30(6): p. 527-33. Mosti G, Picerni P, Partsch H. 2012. Compression stockings with moderate pressure are able to reduce chronic leg oedema. Phlebology 27(6): p. 289-96. Mosti G, Partsch H. 2013. Bandages or double stockings for the initial therapy of venous oedema? A randomized, controlled pilot study. Eur J Vasc Endovasc Surg 46(1): p. 142-8. Mosti G, Mattaliano V. 2007. Simultaneous changes of leg circumference and interface pressure under different compression bandages. Eur J Vasc Endovasc Surg 33(4): p. 476-82. Cordts PR, et al. 1992. A prospective, randomized trial of Unna's boot versus Duoderm CGF hydroactive dressing plus compression in the management of venous leg ulcers. J Vasc Surg 15(3): p. 480-6. Wong IK, et al. 2012. Randomized controlled trial comparing treatment outcome of two compression bandaging systems and standard care without compression in patients with venous leg ulcers. J Vasc Surg 55(5): p. 1376-85. Scriven JM, et al. 1998. A prospective randomised trial of four-layer versus short stretch compression bandages for the treatment of venous leg ulcers. Ann R Coll Surg Engl 80(3): p. 215-20. 2012. Retracted: Randomized controlled trial comparing treatment outcome of two compression bandaging systems and standard care without compression in patients with venous leg ulcers [J Vas Surg 2012;55:1376-85]. J Vasc Surg 56(6): p. 1830. Lurie FK. 2012. Interface pressure under compression bandages. Wound Care Therapies 1(1): p. 10-11. Trinh F, Fish J, Lurie F. 2017. Compression therapy: what is the real world practice? The American College of Phlebology (ACP) 19th Annual Scientific Meeting. Austin, Texas. Gray RJ, Voegeli D, Bader DL. 2016. Features of lymphatic dysfunction in compressed skin tissues—implications in pressure ulcer aetiology. J Tissue Viability 25(1): p. 26-31. Van den Kerckhove E, et al. 2007. Reproducibility of repeated measurements with the Kikuhime pressure sensor under pressure garments in burn scar treatment. Burns 33(5): p. 572-8. Milic DJ, et al. 2010. The influence of different sub-bandage pressure values on venous leg ulcers healing when treated with compression therapy. J Vasc Surg 51(3): p. 655-61. Thomas S. 2014. Practical limitations of two devices used for the measurement of sub-bandage pressure: implications for clinical practice. J Wound Care 23(6): p. 300, 302-6, 308-9 passim.